Pre-loaded USB Flash Drives are the new DVD’s!! 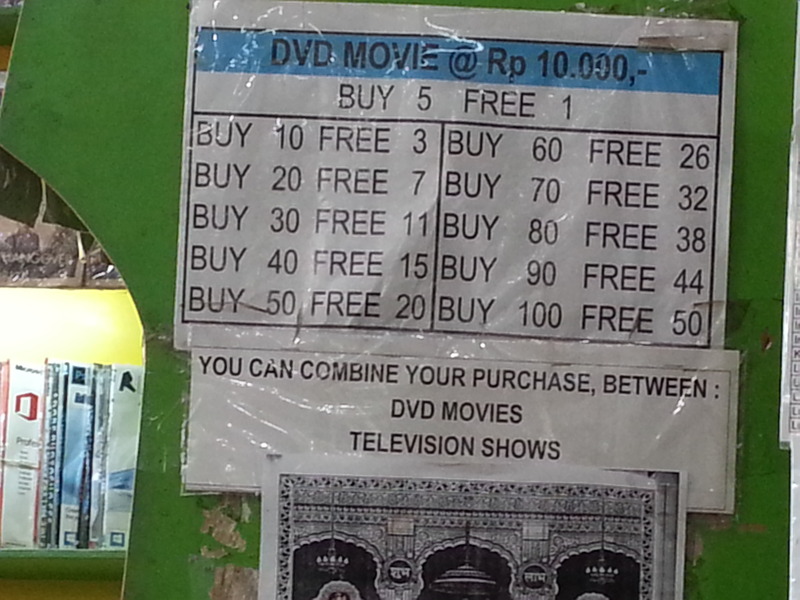 DVD’s have been available for some time in Balinese DVD stores. Some are ‘good quality”. Others, not so good. The going price is usually 10,000Rph each. If you buy 10, you get 3 free; buy 20, get 7 free; buy 30, get 11 free etc. There is always a risk: some are acceptable quality, others stop before the end, lose quality or shadows of people in the cinema are seen on film since the movies are literally filmed whilst in cinema. Although DVD’s are still readily available, an improved solution is to buy movies on a portable USB flash drive. This way, quality movies are purchased that are easily transportable. A USB preloaded with 22 recent movies are now selling in DVD stores for approximately 450,000Rph. Alternatively, you can provide a blank USB to the DVD store and 32 movies of your choice (from their list) can be loaded for approximately 300,000Rph. No scratching, warping or weight of DVD’s to worry about!